Fornication: The Red Hot Chili Peppers Story by Jeff Apter; page 37.
but having no developed musical talent, he couldn’t develop this into any more than support for the group or being their opening MC plus the group already had two song-writing members. However, that was about to change; Flea and Anthony were experimenting with new musical tastes and the group Grandmaster Flash opened up the world of rap to Anthony; suddenly he realised that you didn’t need to actually be able to sing to front a group – just at a time when his friend, Gary Allen asked him to put together a one off opening act for him at the Rhythm Lounge (Grandea Room on Melrose Avenue, LA) in February 1983. Flea started to write the music and Anthony the lyrics, and the two totally meshed; ‘Out in LA’ was born- a song about Anthony’s experiences in LA and of the friends whom he had made there. Follow Fairfax graduates and members of the now What is This which Anthym had developed into, Hillel Slovak and Jack Irons, made up the group and they played the one song as ‘Tony Flow and the Miraculously Majestic Masters of Mayhem’ and rocked the place totally; so much so that they were asked to return the following week with two songs which they did. But more crucially, not only did they have the two songs (the second was ‘Get Up and Jump’) but they also had a new name, the Red Hot Chili Peppers. From that humble beginning, the Chili Peppers grew and developed over the years to become a group selling millions of albums and shifting tickets at sold out arenas worldwide. 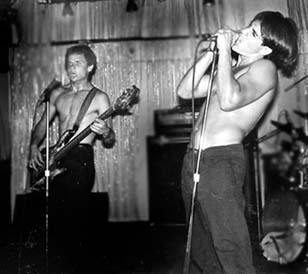 Not that it was all plain sailing; the Red Hot Chili Peppers saw more than their fair share of trials and tribulations along the way that saw changing band members, issues with drug abuse and the tragedy of the death of guitarist Hillel Slovak (he played with Tony Flow and the Miraculously Majestic Masters of Mayhem’ but decided to sign a recording deal with his other band, What is This, before rejoining the Peppers as a bona fide member at a later date) but (with the exception of a month long period when AK was kicked out of the band as a result of his drug addiction), Anthony Kiedis has been the characteristic vocalist of the band with his distinctive vocals and lyrics at the core of everything the Red Hot Chili Peppers stand for. Sou fã do Anthony Kiedis e dos Red Hot os caras são fera demais !!! I’ve always been a big Chilli Peppers fan for over 20 years. What I’m wondering is when did Anthony learn to sing well and in key? I’m mesmerized by this because he did not sing in key or that well until the last few years. No offense, but he used to sound terrible live (for years) and now he sings incredibly live. How did this happen? Training? Autotune? I’m dying to know. Because many of my other favorite bands still don’t sing so well live (ex. Deftones who I love. Sounds like Chino kills himself live). I think he’s taken lessons and just perfected his art with practice over the years. Rick Rubin made a comment in an interview(s) around the time of the release of the ‘I’m With You’ album, how much his voice had improved and that they were able to do more as a result.